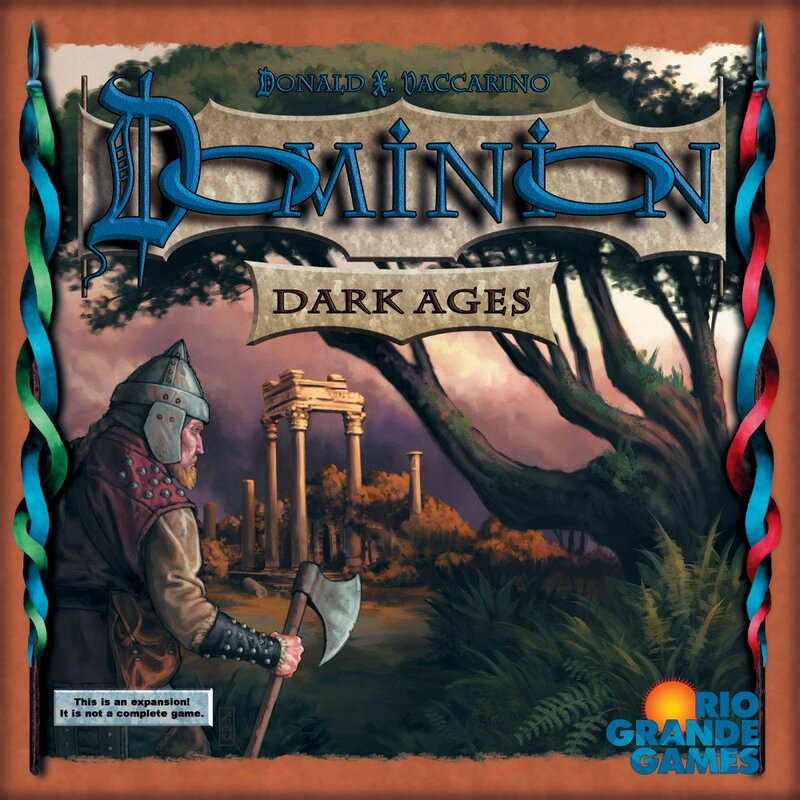 This is the 4th addition to the game of Dominion. It adds 25 new Kingdom cards to Dominion, plus 2 new Basic cards that let players keep building up past Gold and Province. The central theme is wealth: there are treasures with abilities, cards that interact with treasures, and powerful expensive cards. 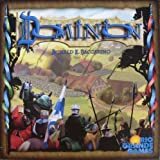 Dominion: Prosperity is an expansion, and cannot be played by itself; to play with it, you need Dominion, or a standalone expansion to Dominion (e.g., Dominion: Intrigue). Those provide the Basic cards you need to play (Treasure, Victory, and Curse cards), as well as the full rules for setup and gameplay. 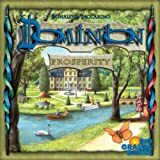 Dominion: Prosperity can also be combined with any other Dominion expansions you have. Prosperity includes 25 randomizer cards (one for each Kingdom card in Prosperity). Players need the Treasure cards, Victory cards, Curse cards, and Trash card from either Dominion or a standalone expansion to Dominion (e.g., Dominion: Intrigue) to play with this expansion. As with previous Dominion games, players must choose 10 sets of Kingdom cards for each game. If players choose the random approach for choosing sets, they should shuffle the randomizer cards from this expansion with those of any other Dominion games they choose to play with. If only Kingdom cards from Prosperity are being used this game, then the Platinum and Colony piles are added to the Basic cards in the Supply for the game. If a mix of Kingdom cards from Prosperity and other sets are being used, then the inclusion of Platinum and Colony in the Supply should be determined randomly, based on the proportion of Prosperity and non-Prosperity cards in use. For example, choose a random Kingdom card being used - such as the first card dealt out from the Randomizer deck - and if it is from Prosperity, add Platinum and Colony to the Supply. Platinum and Colony are not Kingdom cards; when those are included, there are 10 Kingdom cards, plus Copper, Silver, Gold, Platinum, Estate, Duchy, Province, Colony, and Curse, in the Supply. Use 8 Colonies for a 2-player game, or 12 Colonies for a game with 3 or more players. This expansion comes with 8 player mats and tokens for use with the Bishop, Goons, and Monument Kingdom cards. The mat holds a player's pile of tokens collected using those cards. As mats are not needed at the start of the game, a player takes a mat of his choice as soon as he needs one. The mats have different images from the Dominion series, but all function the same. This expansion also comes with Coin tokens which are for use with Trade Route. If Trade Route is in the game,mark each Victory card pile with a Coin token at the start of the game.When anyone gains a card from that pile, move the token to the Trade Route mat. The number of tokens on the mat indicates how many coins Trade Route makes. In games with both Colony and Trade Route, Colony will get a token. Tokens are not limited. If more tokens are needed, use a substitute. +X - The player takes X tokens. He takes them from the pile of unused tokens, not from another player. When a player first takes tokens, he takes a player mat to put them on. tokens are not private; anyone can count them. There are 1 and 5 tokens; players make change as needed. At the end of the game, players add the they have from tokens to their regular score. If the tokens run out, use something else to track any further tokens; players are not limited by the number of tokens available. tokens are used by Bishop, Goons, and Monument. In play - Action cards and Treasure cards played face-up to a play area are in play until they are moved somewhere else—usually until they are discarded during a Clean-up phase. Only played cards are in play; set aside cards, trashed cards, cards in the Supply, and cards in hands, decks, and discard piles are not in play. Reaction abilities like Watchtower's do not put those cards into play. Duration cards (from Dominion: Seaside), once played, remain in play until the turn they are discarded. Prosperity includes eight Treasure cards with rules on them. They are in the Supply if selected as one of the 10 Kingdom cards for the game; they are not part of the Basic Supply. They are just like normal Treasures, but have special abilities. They are played during the Buy phase like normal Treasures and are affected by cards that refer to Treasures. A player may play his Treasure cards in any order and may choose not to play some (or even all) of the Treasure cards he has in his hand. During the Buy phase, a player must play all of the Treasures he wishes to play before he buys any cards, even if he has +Buys; he cannot play more Treasures after Buying a card. In games using Platinum and Colony, there is an additional way the game can end. At the end of each turn, the game ends if one of these three conditions is met: the Supply pile of Province cards is empty OR any 3 Supply piles are empty (4 piles in a 5-6 player game) OR the Supply pile of Colony cards is empty.